Cambridge Cinema Shorts in partnership with Oxjam presented a mini short film festival. An afternoon of watching a great selection of short films from the extensive collection of Cambridge Cinema Shorts. From the quirky horror of Where’s Mary to the wonderfully observed The Charcoal Burners these films are beautifully crafted examples of the art of short film making. Screened in the comfort of The De Luca Restaurant, 83 Regent St, upstairs bar, the audience watch, comment, discuss and enjoy an afternoon of alternative entertainment. The Oxjam Cambridge Takeover is the festival with a difference. Part of a national charity music festival in aid of Oxfam, it has succesfully been going on for the last 5 years helping raise over £1.5 M so far. 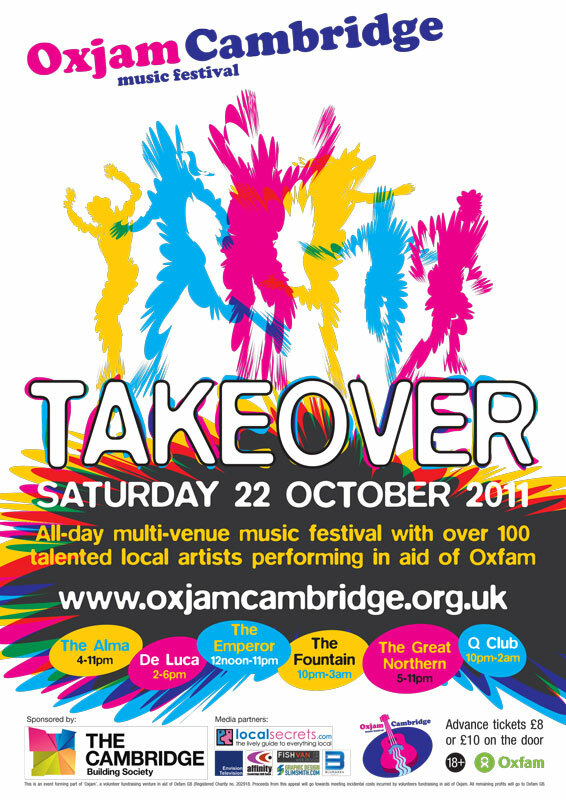 This is taking place in over 35 cities in the UK at the same time and it’s entirely run by keen volunteers who know and love their local music scene, are passionate about Oxfam’s work and want to make a difference in the live of others.